Video in business has seen quite the evolution over the last decade. As we’ve mentioned on this blog before, we’ve hit an inflection point where video is easier to film, cheaper to produce, and easy to measure. This, in large part, is why so many businesses populate your news feed with video. According to our research, 41% of marketers say they post new videos to their YouTube channel every week. 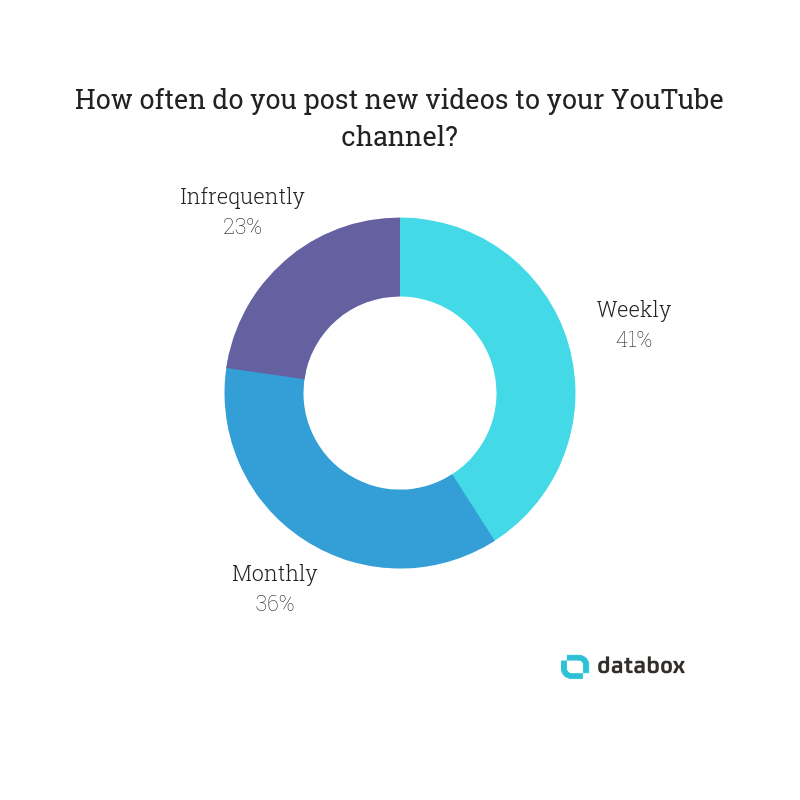 36% say they post new videos every month, while another 23% say they post videos, but infrequently. But, it’s a general rule that when things get easier to produce, arbitrage follows. There are so many videos and channels to watch and subscribe to that it’s become harder for any one brand to stand out. Like blogging in the mid-2000s, marketers now look for ways to differentiate themselves through content in order to find an audience. 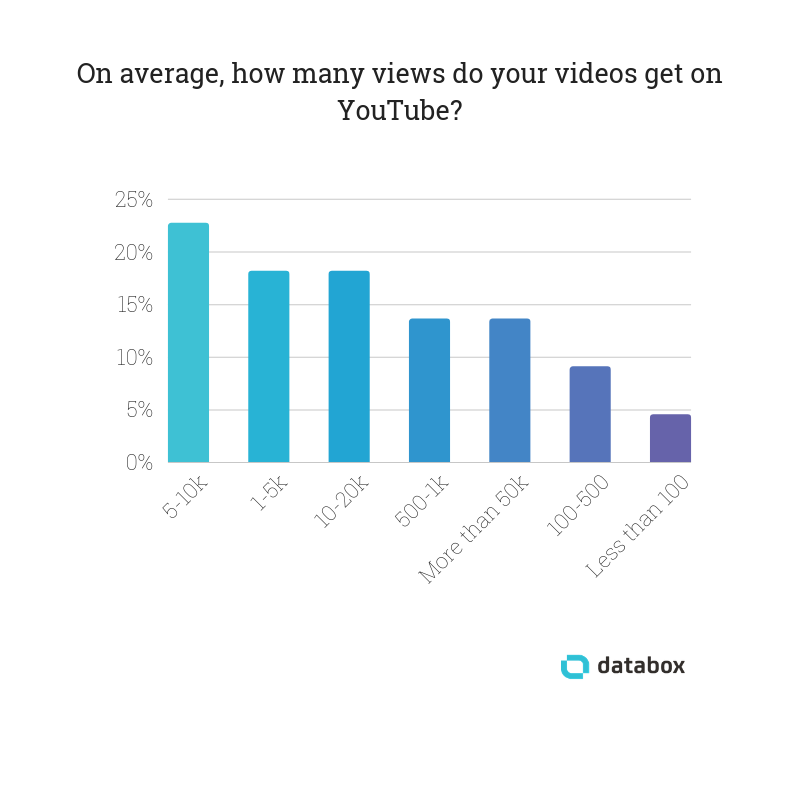 Before getting into those details, we asked marketers to share how many views (on average) their videos receive. 25% of marketers say their videos get between 5-10k views on YouTube. So, what kinds of things work for marketers looking to drive more views to their videos? We polled dozens of marketers to find out. Here’s what we learned. Editor’s note: Want an easy way to track views, watch time, and other important video marketing KPIs? 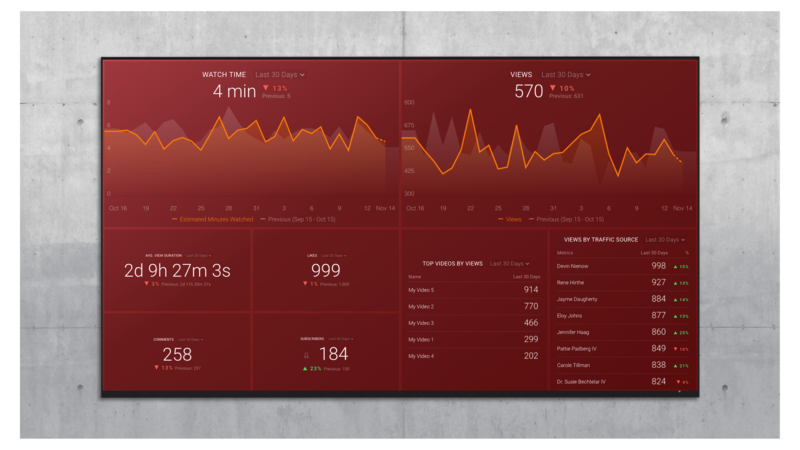 Check out this free, plug-and-play dashboard. DeBell adds that marketers should spend the time to plan out content before shooting any video. “Just like any marketing campaign, video views benefit from a snowball effect. But before a video can snowball, it needs a push,” says Slavik Boyechko of Digital Filmmaker. “You can’t just make a great video, upload it to YouTube, and call it a day,” says BLOOM‘s Ana Cvetkovic. This strategy gets Kettlebell Kings a 10% clickthrough rate when they tell people to check out a new post. “An extremely simple way to getting more views to your videos is to find blogs that are relevant and post a thoughtful comment on the blog with a link to your video,” says Blake Aylott of Shape & Skin Medical. Remember to treat YouTube as a separate search engine, says Ajay Prasad of GMR Web Team. “The most effective way [to increase YouTube view] is to set up strong SEO for your videos,” says The Penny Hoarder‘s Khiem Nguyen. “Rank in suggested videos by copying the tags of popular videos related to your video,” says Mackenzie Thompson of National Health Care Provider Solutions. 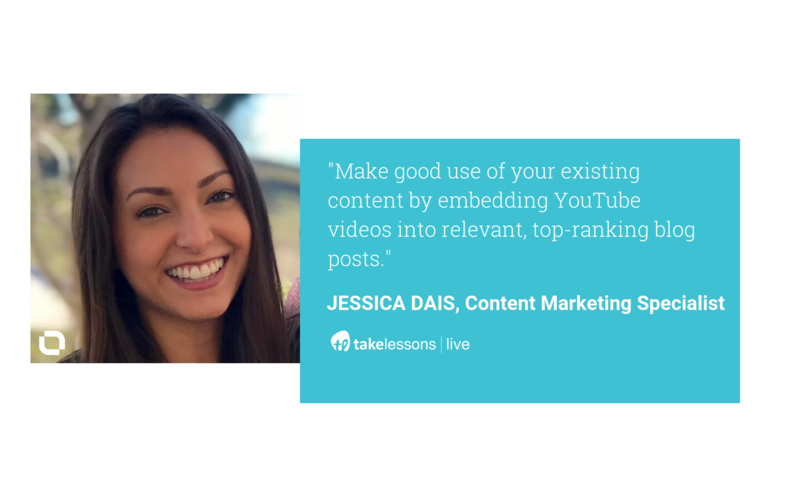 “The most effective way we have seen to drive more views on your YouTube videos is to make a [blog] around each specific video or series of videos,” says Jurassic Sands‘ Joe Sloan. Using this method, Sloan has seen up to half of the traffic on a video coming from the content page. 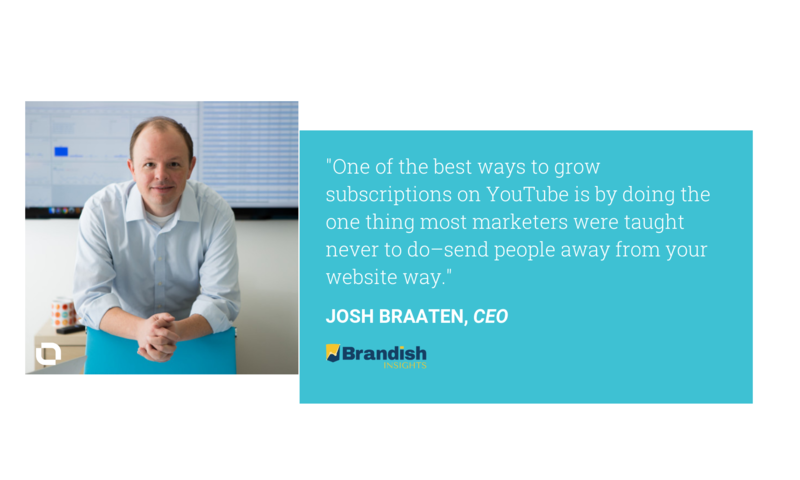 If there’s one thing our marketers agreed on, it was that you have to put in the work to increase your YouTube views. It might be through keyword research, social promotion, ads, or any other number of methods. But it’s going to take time. Provide advice (how to, review, explain, unpack, tutorial). Strike emotion (positivity/aspirational is better). Consider audience (YouTube has more viewers among 18–49s than any US cable network). Give people what they are looking for—YouTube is primarily a captive, intentional audience. They want to be there watching what you have to say, unlike a typical ad on another channel, so focus on quality content. Create a memorable tagline or catchphrase with good scripting and solid messaging. And bucking conventional wisdom, go long. Newswhip (a social analytics platform) shows that compared to FB, where engagement is best at nearly 3 mins, YouTube’s engagement peaks between 8 and 14 mins. Which tactics have you tried to get more views on your videos? Which were the most effective for you? Share your thoughts in the comments below.